Another weekend has come and gone, and what a weekend it was. This week, I had a fantastic meeting with my physical therapist. She had me working so much more on strength and balance. Afterwards, she did a strength test on me and discovered that my legs and hips are FINALLY equal in strength. That took awhile. 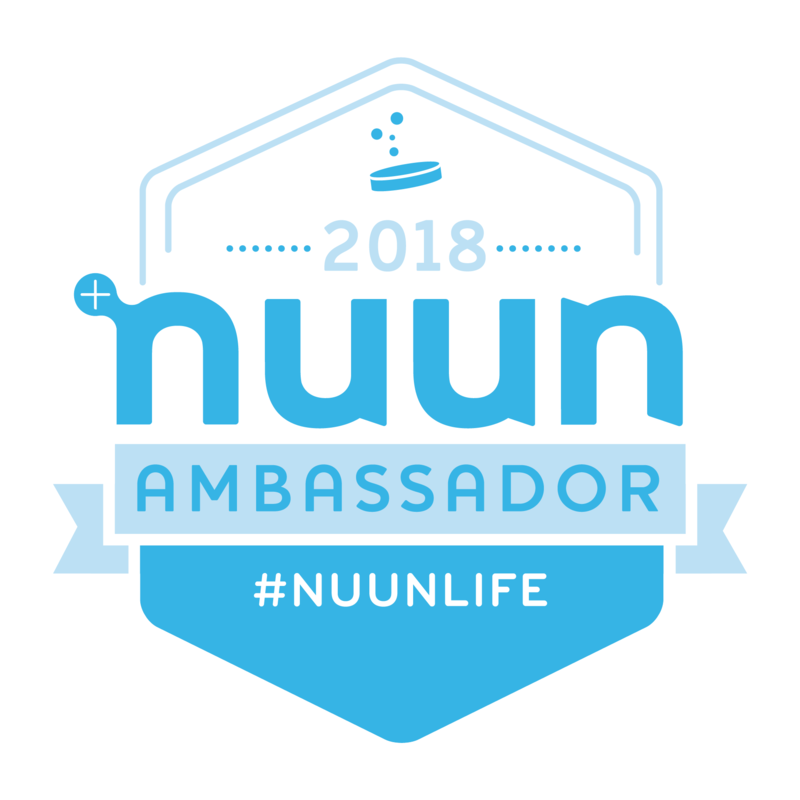 And, with 6 days that day to the day the injury began to really bother me…she was very excited about my first upcoming double-digit run on Saturday. 10 miles was the goal…and I was both terrified and excited about it. And then…my other hip/quad started to act up. It felt like a muscle strain, but it was enough that got me worried about Saturday morning. So, on Friday, I contacted Katie (my amazing physical therapist) and we went back and forth as to where the pain was, how it felt, and what I should do. In the end, she told me to stretch, foam roll, and give the run a shot. If I didn’t hit 10…then to try again the following week. On Saturday morning, in air temps that felt like 1°F…I struck out on my run…on a steep hilly course…and got through it. Pain free. No limping. No pain. Nothing. It made me feel confident and amazing and strong…all at the same time. And relieved. This is an ongoing battle, for sure…but I needed that run. More than I even knew until I was done. Side-by-side or miles apart, we are sisters connected by the heart. Seriously, my sister and I have always been close. We have seen and done so much together. We have been with each other through thick and thin. Our bond is amazingly strong. When we get together…watch out. Insanity ensues. She wanted to come and visit and chose Valentine’s Day weekend to do so. And we had an absolute blast. Added bonus…she brought one of her boys with her…Chace (age 6). And we had SO much fun. We braved the cold air and the snow…which Chace loved…we ate good food…we shopped…we played video games…we attempted to play Chinese jumprope, we laughed, snorted, and curled up together to watch a movie. Chace and I baked a special cake. Chace told me that he loved me. Do you know how much that made me want to cry (in the good, happy way)? These are the moments I live for…and miss out on…because I live away from the rest of the family. I hated it when they had to leave. I cried a little this afternoon. But, she’s already planning another trip…and bringing Landon (age 9) this time. I love my sister. And next time, the weather should be better so she and I can finally get that run in together. I am now the proud owner of a BOSU. I have wanted one for a long time now, but when this became part of my physical therapy, not having to go to the gym to do it became a bit of a priority. The BOSU Balance Trainer is an exercise tool that targets multiple areas of fitness like endurance, strength, balance, and stability. The squishy dome side on top offers a bouncy surface for everything from cardio to strength training. Flip it over…and you work your on your core, lower body , and flexibility. Due to lots of amazing Dicks coupons and a gift card…I didn’t pay anything out of pocket for this. I love it. It’s pink…not blue like they normally are (because…princess). And now I can work on the strength and balance exercises that Katie (the PT) gave me to work on…in the comfort of my own home. SO happy! As I mentioned, this Saturday I was set to run 10 miles. I had originally made plans to do this early to have a bit more time with my sister and nephew…but those plans didn’t pan out. Probably for the best, with how cold it was. All that being said, I got up and went out to run with the training group, and ended up striking out for the first 3.5 miles with people from my old running group. It felt so good to be back out with them. They ended up not tackling the heavy hill climb at Iroquois, but since I skipped hill day due to weather, I decided I needed to climb, even though my PT said to try to stick to flat roads. Seeing them, running with them, talking to them…it all just lifted my spirits. I hadn’t felt that good in a long time. I knew I missed it…but I really miss them. Sometimes something as simple as a new pair of shoes can make the world feel better. Everyone knows that I love running in Newtons…but…I also love me some bright colors on my feet. And the new version of my Newton running shoes are…silver. Life’s too short to be stuck with boring running shoes. And, as I was in need of new shoes, I went out to fleet feet and went to see Jackson (it was his last day there)…and tried on the shoes I originally went in for…the Adidas Pure Boost X (the ones that were made by women for women). They were…not what I expected. Very different. And, while they felt good, I was a bit worried about lack of support on the arch of my foot. So, Jackson went to work. After I said no to the Adidas Energy Boosts (too much shoe)…he brought out a few more to try. After I gave the Asics Gel Cumulus a try (liked them), and then the Brooks Women’s Launch 3 (loved them), and then the Nike Pegasus Air Zoom 32 (really loved them)…I did something I didn’t expect. I went back to a Nike shoe. Of course, I still have to really road test them, but they felt really good in store. I have heard only good things about the Pegasus…so here’s hoping! THANKS, JACKSON! He wanted to see snow…he got his wish. He was so excited. And so cold. Love this boy! Chace is like his Auntie KJ…he loves to cook and bake. And this weekend, he brought the chef hat and apron I got him for Christmas and go to work baking a cake for dessert and to take home to his dad, brother, and sister. It was a gluten-free funfetti cake (sprinkles rule!) with a strawberry frosting and decorated with some red sprinkles for the Valentines Day holiday. He’s an amazing little boy in the kitchen, and he’s got quite a future as the chef he talks about becoming. The cake…for the record…was super-moist…and super-yum! Afterwards, we all snuggled on the couch and watched Pixar’s Ratatouille. I have met some of the best people through running. After taking an entire (basically) year off due to this nagging injury, it feels good to be out and running (even if it is slower than I would like) with people. Sometimes, I end up alone and on my own. But I always start with a group. And in these groups, there are people who just make you feel welcome. That’s how Melissa made me feel on Saturday, when I was standing around, arms crossed, just dreading going out in the cold. She pulls me into a picture…and everything just felt better that morning. Sometimes it is the smallest gesture that makes all the difference. Thanks, Melissa!! My local allergen-free bakery…Annie May’s Sweet Cafe…sold out, but reserved a cup of their cookie dough for me…because Valentine’s Day isn’t much fun when you’re single…so a big cup of cookie dough is a good meal choice, yes? The hardest decision after getting it out of the fridge today was to have it with red or white. HA! I love my bakery!! Sometimes you just have to be goofy…in a nice restaurant…with your nephew who requested to sit by you. Because life only happens once. Just be goofy! I love him! Forget Valentines Day. Just give me chocolate. Dark chocolate, especially. I’ll love you for life. And, trust me, I ate plenty of chocolate this weekend. Because I love enjoying the sweeter things in life with the sweetest people in my life. And we are a family of chocoholics. It’s a lifestyle. Heading into a new week…here’s hoping this upward trend in my recovery continues. Here’s hoping that the winter weather goes away for good. Here’s hoping for many more good days over bad. It was the start of a new year. Yes. January 2015. And what happens at the start of a brand new year? New Year’s Resolutions! WOOO!! I am proud to say that I don’t make resolutions, because I don’t like to make promises I can’t keep. I do, however, try to make each year a good one and try to improve on some things. Well, my New Year 2015 (January) Cuisine Cube, took a lot of the work out of that by providing a box of 6 healthy choices for food/snacks. YAY! So, as you all are pretty much aware, Cuisine Cube is a delivery subscription service that brings smaller, lesser-known, artisan products from the gluten-free food world to your door. Yes, some of them I have heard of…but most I haven’t. And that’s the beauty of this service. Without it, I’d have no idea that some of these products or companies even existed. And, subscriptions start for as low as $29.99/month. It’s a great deal and a great service. If you haven’t tried it or have been meaning to give it a try…do it. You’ll end up loving it as much as I do. So, January was all about healthy products it seemed. And the product that was packed inside for the Lunch option was this great little Indian spiced meal kit from Jaali Bean. It was the Jaali Bean Cumin and Pea Lentil & Brown Rice Kit. It sounded beyond delicious as I am a huge…and I mean HUGE…lover of Indian food. Around here, I can find a plethora of the Tasty Bite Indian meals, but this was the first time I ever heard of Jaali Bean. Already, I was intrigued. Jaali Bean was created by Brian and Molina Junkins, a husband and wife team who shared a passion for food, family, and healthy living. They also had a passion for helping people discover the amazing flavors and tastes that are incorporated in Indian cuisine. They challenge everyone to toss aside their preconceived notions about preparing Indian cuisine at home, because they make it all happen within minutes with these great little kits they put together. It is super easy and the are just loaded with all-natural ingredients and all the spices that make you fall in love with Indian food. They really do make it easy. The Jaali Bean Cumin and Pea Lentil & Brown Rice Kit comes with two packages attached. Inside is the brown rice and lentil mixture. In the smaller pouch…the spices. Simply set a pot on medium-high heat and heat up 1 tablespoon of oil. Put the spice packet in and stir for about 40-50 seconds. You’ll know when it’s done when you get that amazing aroma out of the spices. Do not burn them. Add 2-1/4 cup water and bring to a boil. Once the water is boiling, turn the heat down to low, cover the pot, and let it cook for 30 minutes. After 30 minutes, remove the pot from the heat and give it a stir. Let it sit for an additional 5 minutes. All the extra liquid will get absorbed. Trust me. It works. You are left with a fantastic pot of moist and creamy looking rice that smells as amazing as it looks. But the true test is always with the taste. And, let me tell you…Jaali Bean Cumin and Pea Lentil & Rice Kit cooks up an amazing taste of India. Better than Tasty Bite…and as close to authentic restaurant quality as possible at home. Amazing. I grew up eating Indian food, thanks to my neighbors up the way, who were from India. The cuisine has always resonated with me. And I know what is good and what isn’t. Jaali Bean is delicious. Seriously…delicious. The rice cooks up rich and creamy, seasoned to perfection. It’s mild in flavor, so add a kick of your own heat if, like me, you like things a little spicier. I think my only complaint was that there wasn’t enough peas for my liking. How’s that for a complaint, eh? Seriously, perfectly seasoned and it cooks up beautifully. Nothing else I have had packaged has come close to tasting this close to the real deal. I am beyond impressed. So…let’s discuss what all goes into the Jaali Bean Cumin and Pea Lentil & Brown Rice Kit, shall we? This kit is a combination of par boiled long grain brown rice, orange masoor lentils, peas, spices (which include cumin, mustard seeds, coriander, dried red chili powder, and amchur powder), salt, cane sugar, tomato granules, and nutritional yeast. It is gluten-free, cholesterol free, vegan, and non-GMO. 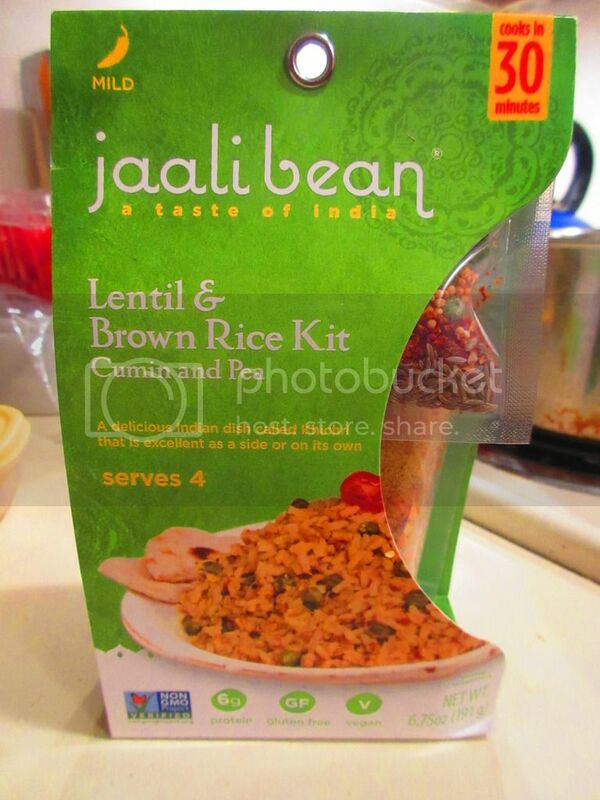 As for the nutrition information in regards to Jaali Bean Cumin and Pea Lentil & Brown Rice Kit…I was very impressed. A serving is 1 cup and there are 4 servings per package. Each serving will provide 160 calories, 2 grams of fat, 380 mg sodium, 32 grams of carbohydrates, 2 grams sugar, 4 grams fiber, and 6 grams of protein. Healthy, filling, and delicious. You can’t go wrong. Honestly, I’ve never seen Jaali Bean products around here, so without my subscription to Cuisine Cube, I might still be in the dark. With that being said…these products are now on my radar and I know how to get my hands on them via the Internet, if I can’t find any here. And that, my friends, is a very good thing. I’ll definitely keep these on hand for a quick and easy go-to meal. On a side note, this product wraps up my January 2015 cube. The only product I didn’t get to blog on was the Budi Bar, because somehow I missed the note on freezing it and it got all fuzzy and moldy. I was sad when I had to throw it away. But…perhaps I’ll run across them somewhere around here. Or, I’ll just order one online. We’ll see. I’m having one of those weeks. One of those weeks where it just seems like I don’t have enough time. For anything. Let alone cooking. And despite some fresh produce still in my crisper, it was the eve of an early gym morning, late afternoon emotional burnout, and a long day at the office. The last thing I wanted to do, especially with Valentine’s Day goodies to make still, was try to make dinner from scratch. I did that last night…having to eat my delicious Maple Roasted Brussels Sprouts with Walnuts…standing up, while stirring a pot of melting chocolate that would become a decadent and rich chocolate mousse. Don’t get me wrong…I love making gifts for people who appreciate it…but sometimes I just want to sit down and relax. More and more these days, there isn’t enough time to think let alone relax. What would be ideal would be something that I could simply throw in the oven, the microwave, or on the stove, set a timer, and get some stuff done. Like lunches and snacks for lunch the next day. So, after much searching through both pantry and freezer, I decided to pick out one of the boxes of rice meal things that were lurking right up front. I had about three or four to choose from, but ultimately reached for a brand I know, I love, and I trust. Lundberg is committed to producing the finest quality rice and rice products. And since 1937, the Lundberg family has been growing healthy, great tasting rice while respecting and sustaining the earth. With the third and fourth generations currently carrying on the family heritage, using eco-friendly farming methods to produce wholesome, healthful rice, rice cakes, rice chips, risottos, and pastas while improving and protecting the environment for generations to come. Gotta love a company that has a heart. So, Lundberg Family Farms recently began expanding their line of rice products into these little rice and pasta sides. I picked up some pasta awhile back…but this time I had my eyes set on the new rice sides. I was visiting my friend Jenn in Columbus, Ohio, and stopped into my new favorite store there, The Raisin Rack. I filled up a small basket of items and products I wanted to try that I had a hard time finding in my area. 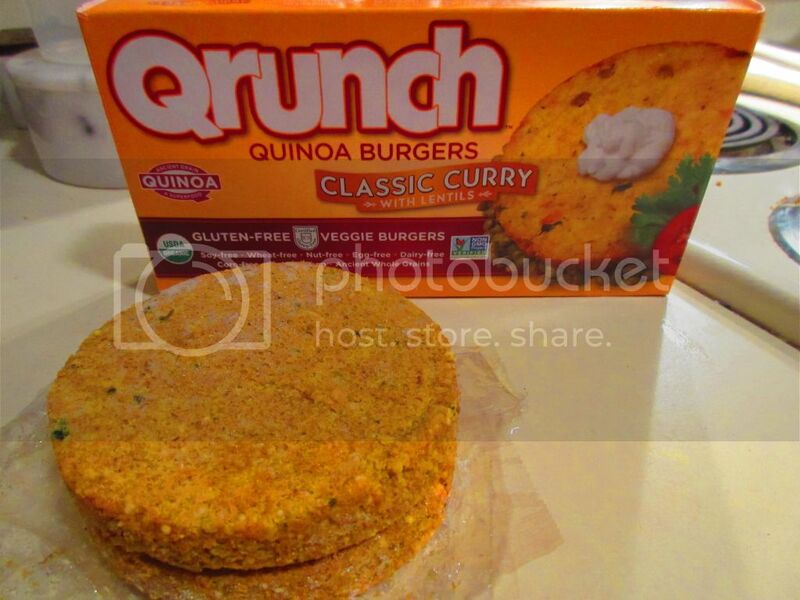 And one of these, at the time, was Lundberg Family Farms Organic Whole Grain Lentils & Rice – Mild Curry flavor. The Mild Curry was what actually caught my attention. The other being that these little boxes make for easy meals every now and again. And while I don’t like to cook out of packages, sometimes it just becomes necessary. But, the best part is, you can choose what you purchase to use in these situations. And, for me, Lundberg Farms uses great ingredients, non-GMO, and really cares about the environment. I have never had an issue with any of their products, so…for me…this made for a great meal (my roommate and I split the box between us instead of using it as a side dish). It was very easy to make. Just combine water, rice, lentils and the seasoning packets into a pan and stir well. Bring it to boil, then turn the heat down, cover it, and allow it to simmer and cook for about 30-32 minutes. Do not lift the lid. Just let it cook. Remove it from the heat and allow it to stand for 5 minutes before fluffing it with a fork and serving it up. Simple. And it was so hands free. No need to babysit the pan and remember to stir it every now and again. It was perfectly ideal for a night like tonight. I finished up my prep work for lunches and snacks, talked to my sister on the phone, changed into pajamas…and got some gluten-free focaccia bread heated up to accompany the meal. Then, I dished the rice and lentil mixture into two bowls. It smelled fantastic. Honestly. It had this great cumin and garlic aroma that just wafted up from the pan when I lifted the lid and began splitting the dish between us. The rice was fluffy and the lentils to that perfect al dente. The yellow hue was brought about by the use of most of the curry spices, especially turmeric. I love turmeric. It’s a great anti-inflammatory. And with how bad my back has been lately…it’s my new best friend! So…dinner was served. And HOLY CURRY GOODNESS…this was fantastic. For one thing, the flavor is mild. So, when it says “Mild Curry” on the box…believe it. This will not burn your tastebuds off or set your mouth aflame. In fact, my roommate actually turned into me for a small moment and said she missed it having a bit more heat. That’s weird for her to say, since she is a heat wimp. But…yes…the mild flavor compliments the grains, rather than overpowers. And that is a good thing. I agree though, I could have used a little more spice level regardless. But, it tasted absolutely amazing. It cooked up to be light and full of these rich Indian flavors. 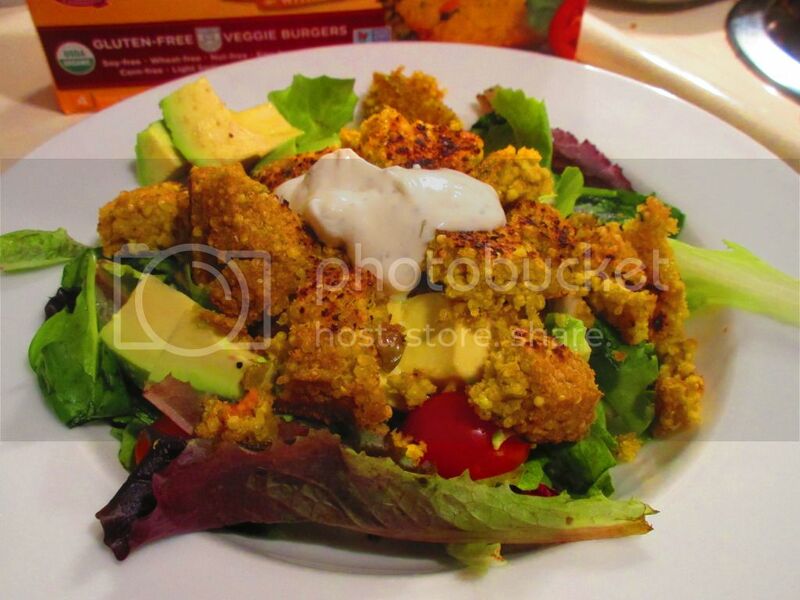 And it was packed with nutrients and healthy carbs…so it made for two very happy diners as we ate our meal. Let’s talk ingredients, shall we? One thing I love about Lundberg Farms is their use of real ingredents. You won’t see ingredients you don’t recognize in their products. 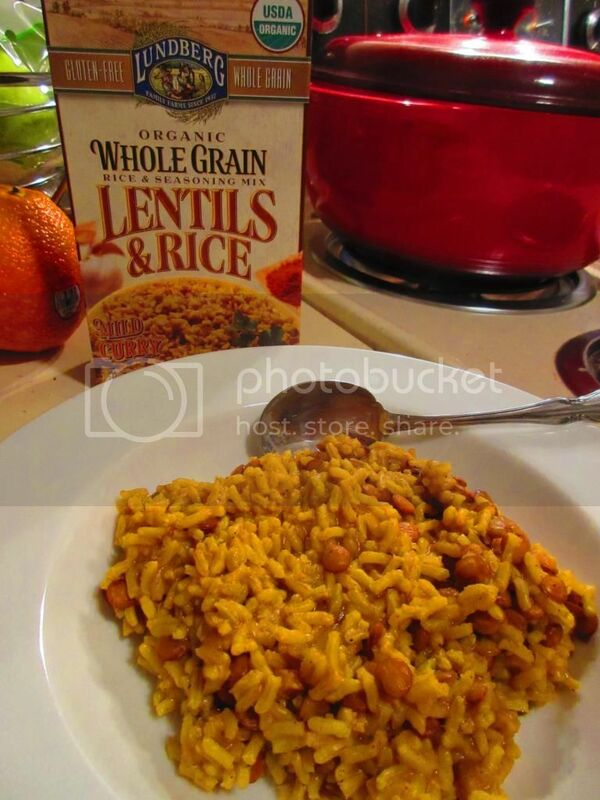 In the Lundberg Family Farms Organic Whole Grain Lentils & Rice – Mild Curry, you will find organic parboiled brown rice, organic lentils, organic rice flower, sea salt, organic spices (ginger, turmeric, coriander, cumin, cinnamon, black pepper, and fenugreek), organic garlic powder, organic rice concentrate. 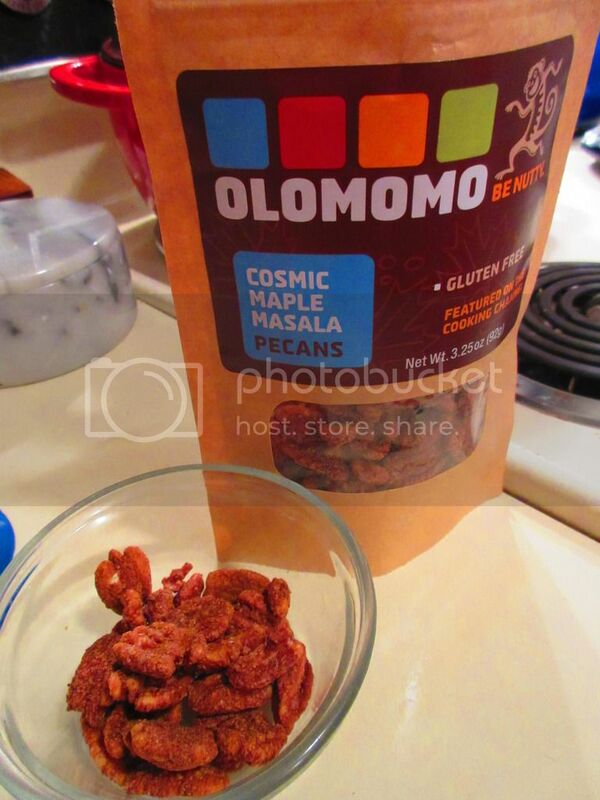 This box of whole grain goodness is also vegan, non-GMO, cholesterol free, and kosher. 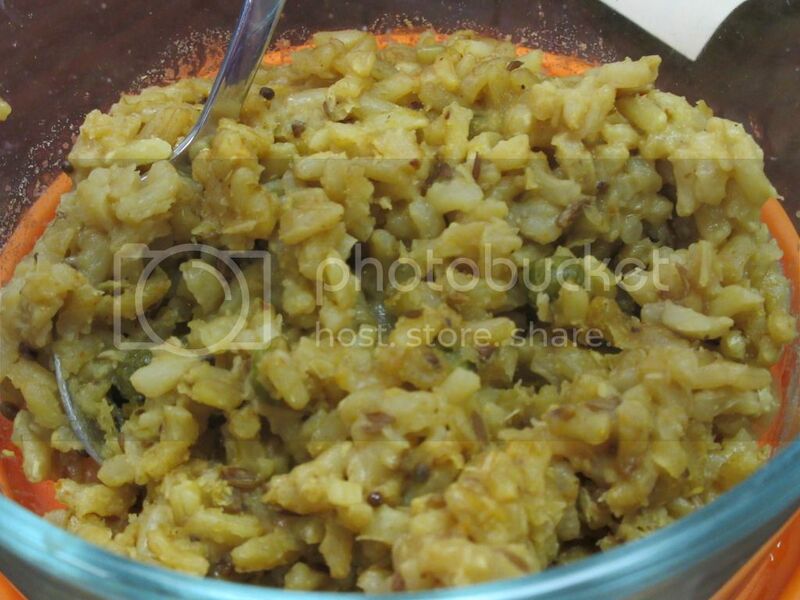 As for nutrition, a serving of Lundberg Family Farms Organic Whole Grain Lentils & Rice – Mild Curry is 1 cup, prepared. There are three servings per box. In this serving, you will be consuming 210 calories and 2 grams of fat. This serving provides 460 mg sodium and 0 grams of sugar. Both of these are really low for a boxed product. In addition, you will feel full after dining on this because one serving also provides 3 grams of fiber and 6 grams of protein. I asked Cathy if she would be happy having one of these boxed rice meals from Lundberg Family Farms again, and she totally said she would. And I have to agree. Great flavor. Great texture. And wholesome ingredients. What’s not to love when it’s so easy to cook up and so easy to eat. And good for you too! Gotta love that. Another product win from Lundberg Family Farms!